144Hz (and higher) displays are becoming increasingly popular - we picked Asus’ PG279Q with its 1440p/165Hz screen as our best gaming monitor - but those speeds are nothing compared to a prototype display one website claims to have received, which runs at 480Hz. 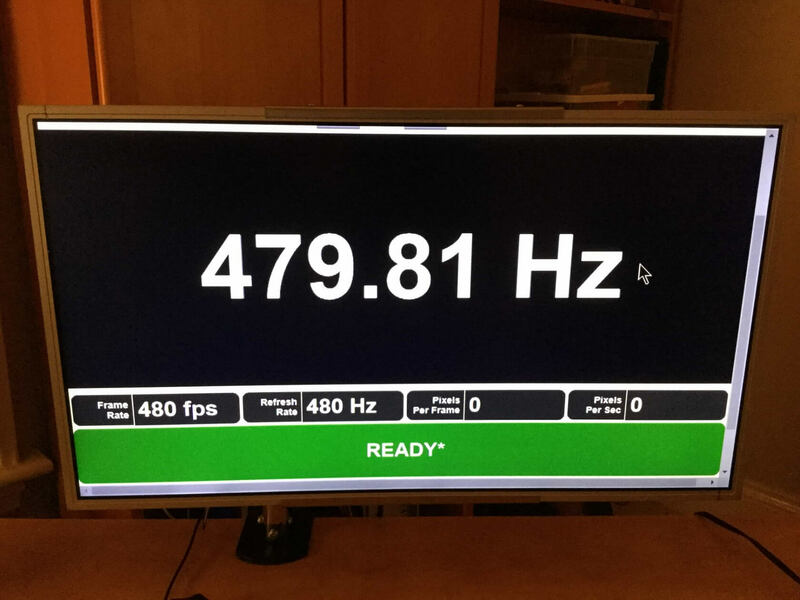 Blur Busters has posted a picture of what is allegedly the world’s first full-color 480Hz capable LCD monitor that is not a laboratory display. If true, it marks a huge increase over the fastest 240Hz products currently on the market. Surveys show that most PC gamers prefer higher refresh rates over 4K screens, but it seems this monitor offers the best of both worlds. The article’s author notes that it’s actually a 120Hz 4K panel that’s capable of hitting those amazing refresh rates when the resolution is lowered, i.e. 480Hz at 1080p. There’s no indication of it supporting adaptive sync technologies such as Nvidia G-Sync or AMD’s FreeSync. Back in April, Acer announced the Predator X27, a 4K HDR display that features a 144Hz refresh rate and G-Sync. Sadly, both this monitor and a similar device from Asus (the ROG Swift PG27UQ) recently had their launch dates pushed back until next year. When they do arrive, we may find that they also run at even higher refresh rates when the resolutions are dropped. Hitting 480fps, even at 1080p, is going to take a beefy graphics card, and it’s likely that most people will prefer to game at 144Hz in 4K. Still, it’s a very impressive feat, and I’m interested to find out what playing a twitch shooter at 480Hz would be like.